Theresia’s fans know it: we love Joseph Martin Kraus, and we have a special chemistry with this composer. His music is surprising, his life is fascinating. Plus, there’s one particular oddity that makes him a bit more special: Kraus was born the very same year as Mozart (1756) and died just one year later (1792). This is the reason why he is called “the Swedish Mozart”, or “the Mozart from Odenwald”. Yet, his music is not as worldwide renowned as Mozart’s. One may think this is partly because he spent almost his entire professional life in Stockholm, as Kapellmeister of the King of Sweden. Encounters can determine our fate, and so it was with Kraus too: in Gottingen, he had become friendly with a Swedish fellow student, Carl Stridsberg. He persuaded Kraus to accompany him to Stockholm to apply for a position at the court of King Gustav III. After three years of misery, King Gustav III eventually noticed him: Kraus wrote the music for the opera “Proserpin”, which was successfully premiered at Ulriksdal Palace on 6 June 1781, before the King and the royal household. Kraus was appointed vice-Kapellmeister of the Royal Swedish Opera and director of the Royal Academy of Music. What else happened in Vienna? 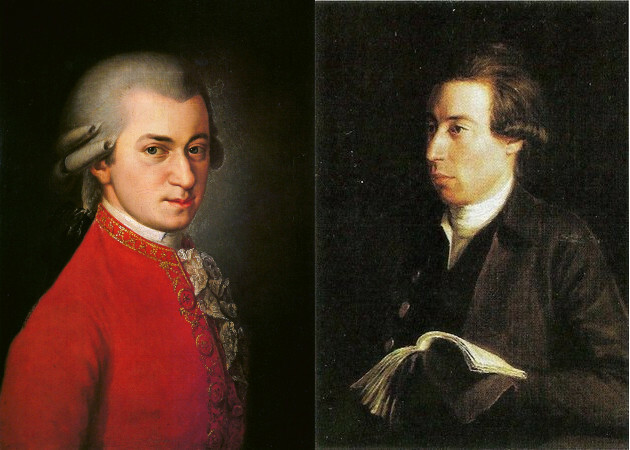 Somewhere else in this blog we wrote about the mystery of the meeting of Kraus and Mozart: nobody really knows if they actually met. Yet, we can imagine it, and, moreover, we can enjoy a sort of virtual and contemporary encounter playing their composition. Theresia will perform Kraus’ Symphony in c minor VB 142 and Chaconne from “Aeneas i Cartago” VB 23 together with Mozart’s Overture from “Le Nozze di Figaro” KV 492 and Symphony n. 35 in D major “Haffner” KV 504. Theresia will perform under Claudio Astronio’s baton on the 8th June in Malborghetto and the 9th June in Udine, as a guest of the “Risonanze” Festival.